The Index opened positive and scaled 8400 within the first few seconds and stayed above it for the entire session though in a very narrow range and closed the day at 8423.25, gain of 57.60 points. The broader market was just positive, with 763 advances to 727 declines. Developing Range as per Option Table is at 8100-8600. 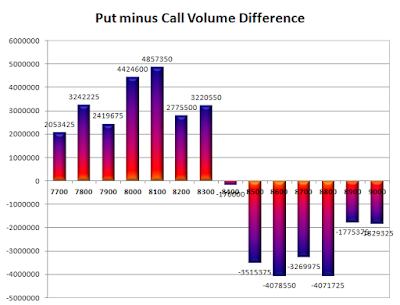 Call option 8800 added 1.78 lacs OI with short covering seen at 8400 and below strike prices. Put option 8500-8100, 7800 added huge 34.55 lacs OI with profit booking seen at 8000 and below strike prices. 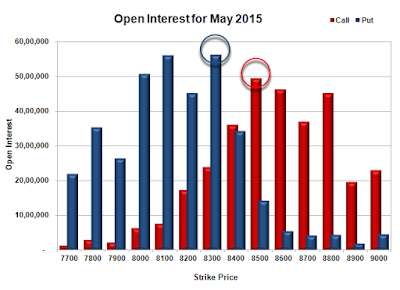 Nifty Open Interest is at 1,35,83,475 down by 19,600, with increase in price, most probably short covering. 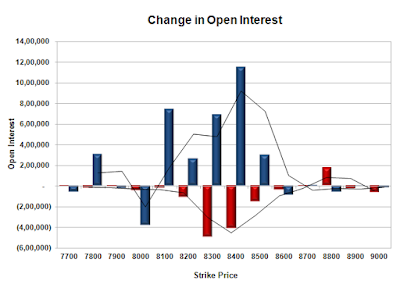 Bank Nifty Open Interest is at 17,70,450 up by 94,975, with inn price, most probably huge long build-up. FII’s bought huge 9.31 lacs Futures, which includes 40237 contracts long build-up and 3011 contracts short build-up, with increase in net OI by 43248 contracts (includes 79869 longs to 42643 shorts for the day) and the Average Price comes to 9013.66. 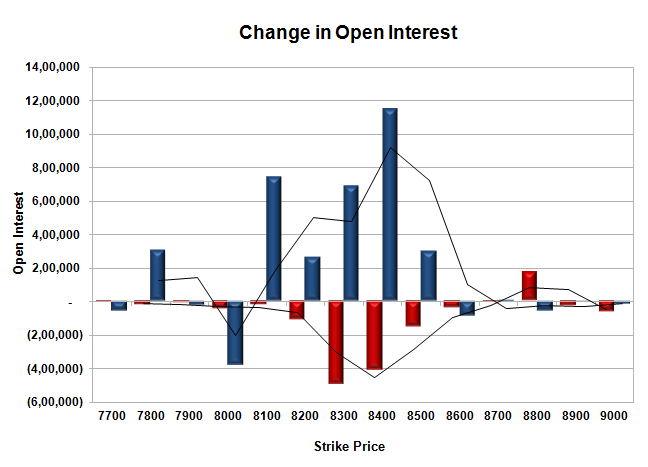 FII’s Index future open contract as on date is 281607 Longs to 27444 Shorts, Net Long 7163 contracts. Initial support at 8400, with huge OI addition of 11.49 lacs and below that at 8300 with highest OI of 56.16 lacs. Initial and best resistance at 8500, with OI of 49.45 lacs and above that at 8600 with OI of 46.27 lacs. Day Range as per Option Table is 8332 - 8507 and as per VIX is 8345 - 8501 with 8418 as the Pivot.